Alluring (asinine) alliteration aside, allow me to set the scene for a rare sighting. You are a Boy Scout in a suburb of the nation’s capital. As a Troop, on this fine Saturday morning, you are out delivering mulch, the lifeblood of a fundraising operation. On your fourth trailer load of the day, your back is hurtling towards the “sore” end of the continuum. Yet, to your amazement, you spot something at the next house that lifts your spirits. 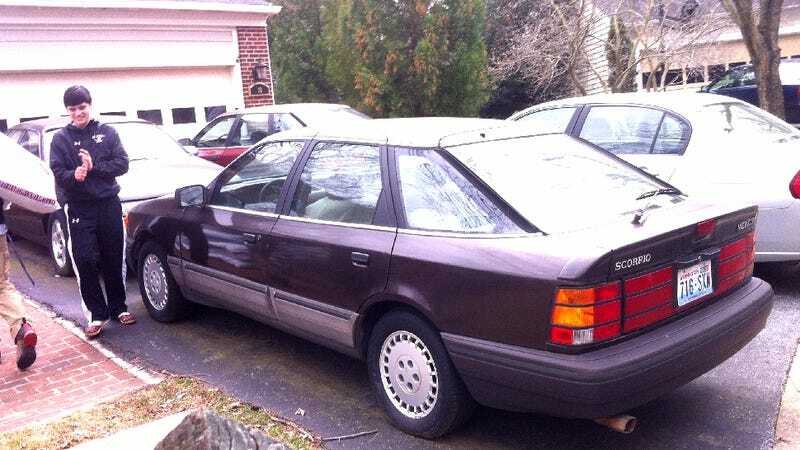 You are this writer, and you caught sight of not one, not two, but three Merkur Scorpios parked at one house. As the sage once said, who’da thunk it? Here I sit, the next day, the muscles of my back certainly not in a state of relaxation. But, hell, I got to see three Merkur Scorpios in the span of ten minutes. I’ve gone my entire life without seeing a single Merkur, let alone three in a day. For those who are unaware (likely very few of you), the Merkur brand represented Ford’s effort to sell its German offerings stateside. Like so many captive imports, the brand fizzled out after a miserable four-year run, unable to establish an identity or a niche. The Scorpio was a modified rebadging of the European Ford Scorpio, marketed as an entry-level luxury liftback. Produced from only 1987 to 1989, and if one can trust Wikipedia’s numbers, only 22,000 examples were sold. A cursory examination of the roads and of the internet suggests that a mere fraction of these exist today. Three of them, at least, reside at a house in Maryland. As we dive into the photographic evidence, allow me to apologize for quality. The cars were difficult to access as they were parked absurdly and obsessively close together (which made delivering mulch difficult, to say the least.) Not to mention the fact that my fellow scouts were absolutely not fans of me standing around taking pictures while they carried all the mulch. Still, I was able to capture some snaps for you fine readers. The most accessible example (lead image) appeared also to be the most drivable. Though it does have Washington plates, it seems unlikely that the car was just visiting from that fine state, as they expired in 2010. And, who in their right mind would road trip across the nation in a 30 year old Ford? Still, perhaps this owner is not in his or her right mind. The car was in generally complete condition, sporting that oh-so-dated shade of 1980s brown and sheepskin seat covers. The interior was basically trashed, but aside from some paint peeling, the outside had aged remarkably well. Except for that color. This red example was parked in the back of the driveway, and showed a few Bondo repairs. It was difficult to capture, and in slightly worse condition than the brown Scorpio. Finally, this blue car (which you can hardly see) appeared to be in the best condition. I nearly missed it as we drove away as it was parked down the street. I think it's safe to assume it belonged to the same owner, and I believe it had current Maryland plates. Daily driver, perhaps? The other two cars may be around to help keep this one on the road. Its paint was shiny and it was in generally decent condition for a car of its age. Is this a collection of vintage cars, salvaged from the junkyard for restoration? Or is it an owner’s gathering, a meetup of Scorpio owners from around the area? I’m inclined to believe that this enthusiast is a fan of the Merkur brand, and the Scorpio in particular. Evidently a gearhead, he also had an early Taurus SHO parked in the driveway, though a rental-spec Malibu suggested a reliable daily driver. I’d like to think these three cars belong to a single owner, dedicated to preserving these rare beasts, and the plateless quality of the cars suggests this is the case. Perhaps we’ll never know, but these three rare obscurities certainly were a sight for sore eyes, even if they did nothing for sore back. It’s nice to know that these obscure German-American hatchbacks with their wacky taillights have finally found their niche. All images (questionable in quality though they may be) copyright James Gallagher 2013, all rights reserved. Are autonomous cars a bad idea or am I just afraid of change? Why do so many of us drive boring cars?